Although our faithful canine companions are equipped with a warm fur coat and tough paw pads they’re still vulnerable when the cold weather chill sets in. Even if your dog spends most of his time outdoors during the warmer months bring him indoors during the winter. A good rule of thumb is if it’s too cold for you, it’s too cold for your dog. “It’s a good idea to introduce him gradually to lower temperatures rather than expose him to extreme temperatures for long periods of time,” Ryan says. Breeds such as Huskies, German Shepherds and Saint Bernards are more adept at handling colder temperatures. But dogs with thinner hair such as Chihuahuas or Greyhounds can benefit from a cozy sweater or jacket. 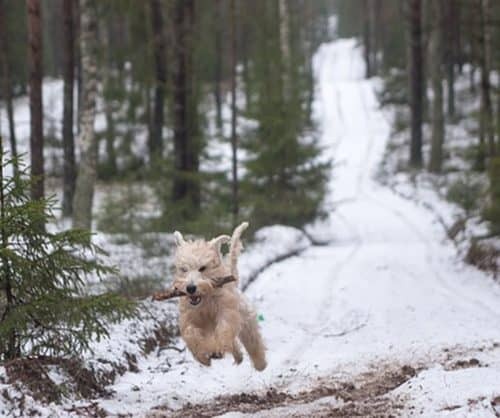 After a walk or run in the snow your dog’s coat will likely be wet or damp. Since most dogs are unlikely to tolerate a “blow out” you can help warm him up with a good towel dry. Monitor your dog’s exposure to the fireplace and space heaters. “Don’t leave your dog unattended in front of a heater or even a candle. They can burn pets the same way they burn people,” Ryan says. Pay attention to potential hazards on your walks such as patches of ice and snow, which can be slippery and frozen over lakes or ponds, which may have thinner areas of ice that can give way. While it’s best to keep your dog indoors during the winter if he does some spend time in his own place it’s important to outfit it for colder weather. “Doghouses should be well-insulated and not drafty with a flexible covering. They should be positioned with the opening facing south because that makes it easier to prevent winds from entering,” Ryan says. Antifreeze and rock salt help make it easier for us to navigate our way through ice and snow but they also contain chemicals that can be poisonous to dogs. So it’s important to take a proactive approach to your dog’s exposure to them. Clean up puddles of antifreeze in your garage or driveway. “Antifreeze smells good to them and it tastes sweet. But it’s incredibly poisonous. Even a small amount can be deadly, lethal, in a short amount of time. If you suspect your dog has ingested antifreeze it’s important to get him to the vet right away,” Ryan says. Rock salt can get stuck in between your dog’s toes and chap his paws. Give your pooch a good wipe down or a rinse off after his neighborhood walk paying special attention to his feet and belly. Ryan says it’s also important to regularly trim the bits of fur in between your dog’s toes where rock salt can get stuck. Seek out brands of rock salt that are clearly marked “safe for pets” at pet stores. Regularly monitor your dog’s water bowl to make sure it hasn’t frozen over. “Pets are just as likely to get dehydrated in the winter as in the summer so be sure to provide plenty of fresh water. Snow is not a substitute for water,” Ryan says. Your dog may expend more energy in the winter to keep warm or less energy if he’s not active and primarily inside. Adjust food levels accordingly. With a house full of people it’s easy to get distracted and not notice how your dog may be enjoying his holiday. “Almost every year I see a dog who eats the turkey carcass out of the trash. They’re prone to getting into stuff that they’re not normally exposed to which can wreck havoc on their health. Be aware of what’s in their environment and how it’s impacting them,” Ryan says. This might not seem an obvious candidate for the cold weather pet safety tips list, but fleas and ticks are capable of surviving cold weather. They may seek out warmer areas in your home or they may take refuge on the warm bodies of wild animals such as squirrels or raccoons. They may also become active on warmer winter days. All of these possibilities mean they can still easily transfer themselves onto your dog. “I see owners get complacent about heartworm prevention and fleas and ticks in the winter. But they can transfer to your pet quickly. I recommend year round prevention,” Ryan says. Older dogs may also benefit from a pair of boots to give their feet an extra layer of cushion and protection. We hope that these 7 cold weather pet safety tips are helpful reminders of how susceptible pets are to harsh winter weather. You can make a world of difference in your pets outlook just by prepping for the cold.